This is definitely one of the strangest Fiats we've ever seen. Milanese design house Garage Italia Customs is one of the oddest vehicle customization shops in the world. We've previously seen the Italian design house build a BMW i8 and i3 that were inspired by furniture, as well as an Alfa Romeo 4C that was inspired by Adidas shoes. Garage Italia Customs has even taken a Fiat 500, and made it look like R2-D2 from Star Wars. The quirky minds at Garage Italia were asked once again to customize a Fiat 500 (this time a convertible model) for a charity auction hosted by amfAR. The charity auction took place in Milan, Italy, during fashion week. 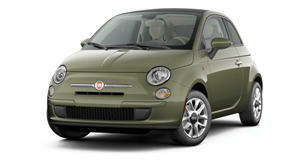 A base Fiat 500C costs around $16,500 and comes with a tiny 1.4-liter engine with only 101 hp. It may seem crazy to want a car with such lackluster performance, but according to Automobile Magazine, someone paid $59,000 for this custom 500C. The money was donated to the charity's cause, which is finding a cure for AIDS. The event is in its ninth year and has raised over $12 million for AIDS research. For the auction, the Fiat was covered in brightly colored horizontal stripes with a matching interior. Frankly, this type of styling doesn't appeal to us. However, we would be willing to purchase some kind of odd car if it meant donating to a good charity. When it comes to custom Fiat 500s, we much prefer the Alfa 4C-powered 500, although that would set us back $180,000.